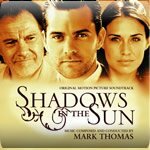 Movie Score Media makes its second soundtrack release for the film, SHADOWS IN THE SUN. This feature film was recently picked up and aired on the ABC Family channel and was received warmly by the public as "the other side of Under the Tuscan Sun." Veteran film composer MARK THOMAS provides a suruprisingly broad score. The music ranges from the contemporary to traditional, Italian compositions. And in between there are solid, dramatic cues. The soundtrack, somewhat misleadingly, begins with "Opening Titles," which is a contemporary piece with a chill-out flare, reminiscent of some of Mychal Danna's efforts. I say misleadingly because this flavor doesn't represent the majority of this release and this theme is only reprised once in track 10, "Riding Free." It isn't long before the film and score alike take flight to Italy. Track 2 launches us into the light-hearted, romantic feel that most of this score features. Mandolins accompanied by a strong string section make for feel-good romp. The feeling flows seemlessly through tracks such as Hunting for Weldon, Shadows Beguines, Weldon Drives and Santa Lucia. In between these two very different styles of music are a number of solid, dramatic pieces of underscore. With the occasional nod to some of James Horner's most popular scores (Legends of the Fall and Titanic) two of SHADOWS IN THE SUN's most engaging tracks are Weldon's Office and The Writer Awakes. A surprisingly diverse soundtrack for a suprisingly enjoyable film (but then again, how can one NOT enjoy Claire Forlani? ), this music package is a quaint, little gem of a score.